Identify your team, product, or anything else! 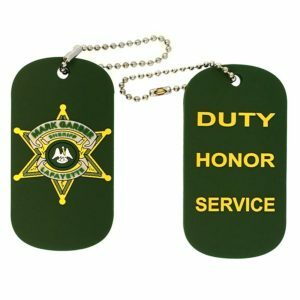 Soft PVC dog tags provide a very versatile and flexible platform to place your emblem/design, or any other identifying information on. Rather than using metal for your dog tag, look towards soft PVC for a more flexible design that will last for a long time to come. PVC Dog Tags are thick and provide a great canvas for your design or information to be conveyed upon. Unlike traditional dog tags, there is no metal used in making this item. Instead, it’s 100% soft PVC rubber. This material allows for a very rigid area to place your information, but also provides the flexibility you need. Unlike traditional dog tags, a soft rubber PVC dog will allow your design to show in ways that you never imagined. Because these dog tags are molded, the ability to add different layers to your dog tag is possible. An example of this would be either adding 2D areas (raised and recessed portions to emphasize certain aspects of your design), or have portions made in 3D (areas that are rounded/convex to give the appearance they are coming at you). Take a look at our gallery to get an idea of all the possibilities using PVC for your next project. Are you considering Custom Soft PVC Rubber Dog Tags for your promotion? Amazing design flexibility: Give your dog tag a unique personality with a 3D design. (or fake a 3D look with 2D layers). Any size is possible: As little as 0.5″ or as big as 3″. Your Dog Tag, Your Size. Use a standard shape or have the dog tag adjust to your design. Thick enough to make them very strong: Standard thickness for PVC dog tags is about 3.0mm. Need it thicker? Let us know and we will make it happen.